"To see the world in a grain of sand, and to see heaven in a wild flower, hold infinity in the palm of your hands, and eternity in an hour." 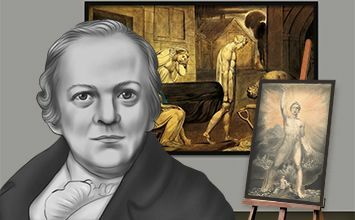 Though he is perhaps still better-known as a poet than an artist, in many ways William Blake's life and work provide the template for our contemporary understanding of what a modern artist is and does. Overlooked by his peers, and sidelined by the academic institutions of his day, his work was championed by a small, zealous group of supporters. His lack of commercial success meant that Blake lived his life in relative poverty, a life in thrall to a highly individual, sometimes iconoclastic, imaginative vision. Through his prints, paintings, and poems, Blake constructed a mythical universe of an intricacy and depth to match Dante's Divine Comedy, but which, liked Dante's, bore the imprint of contemporary culture and politics. When Blake died, in a small house in London in 1827, he was poor and somewhat anonymous; today, we can recognize him as a prototype for the avant-garde artists of the later nineteenth and twentieth centuries, whose creative spirit stands at odds with the prevailing mood of their culture. Blake was perhaps the quintessential Romantic artist. Like his peers in the world of Romantic literature - Samuel Taylor Coleridge, Percy Bysshe Shelly - Blake stressed the primacy of individual imagination and inspiration to the creative process, rejecting the Neoclassical emphasis on formal precision which had defined much 18th-century painting and poetry. Above all else, Blake scorned the contemporary culture of Enlightenment and industrialization, which stood for a mechanization and intellectual reductivism which he deplored. Blake felt that imaginative insight was the only way to cast off the veil thrown over reality by rational thought, claiming that "If the doors of perception were cleansed everything would appear to man as it is, infinite." Blake is unique amongst the artists of his day, and rare amongst artists of any era, in his integration of writing and painting into a single creative process, and in his use of innovative production techniques to combine image and text in single compositions. Celebrated for his visual output, Blake is also recognized as one of the most radical poets of the early Romantic period, combining a highly wrought, Miltonic style with grand, Gothic themes. Moreover, through original techniques such as his "illuminated printing" Blake was able to adapt his craft to meet the demands of his creativity. Blake's spiritual vision was central to his creativity, and was crucially and uniquely informed by a complex, imaginative pantheon of his own making, populated by deities such as Urizen, Los, Enitharmion, and Orc. Grand allegorical narratives illustrated with Blake's own designs, were played out in this universe, which might seem to have existed in a space apart from reality. However, in his epic poem sequences, Blake imagined the fate of the human world, in the era of the French and American Revolutions, as hinging on these sequences, determined by the battles between reason and imagination, lust and piety, order and revolution, which his protagonists represented. 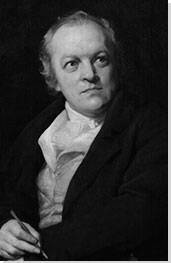 William Blake was born in Soho, London, into a respectable working-class family. His father James sold stockings and gloves for a living, while his mother, Catherine Hermitage, looked after the couple's seven children, two of whom died in infancy. William, a strong-willed boy and an evident prodigy from a young age, often absconded from school to wander through the streets of London, or spent his time copying drawings of Greek antiquities; moreover, inspired by the work of Raphael and Michelangelo, he also developed an early fascination with poetry. Though his childhood was peaceful and pleasant, William began experiencing visions at the age of eight, claiming to see angels on trees, or wings that looked like stars. Though troubled by his stories, Blake's parents supported his artistic ambitions, enrolling him when he was ten at the Henry Par drawing academy, then a well-regarded preparatory school for young artists. Interactive chart with William Blake's main influences, and the people and ideas that the artist influenced in turn. First published on 17 Apr 2018. Updated and modified regularly.